Cover Love: Eh, could be better, but it represents the novel somewhat, so it is appropriate in this case. Summary: The New York Times bestselling novel, Mohsin Hamid's The Reluctant Funamentalist is brilliant and powerful, and now a major motion picture! The Reluctant Fundamentalist is the story of Changez, a young, Princeton-educated Pakistani who goes on to work at a prestigious financial analysis firm in New York City and falls in love with a woman from the upper echelons of New York society. He seems to have achieved the American dream--until 9/11 devastates the city. As the woman and city he loves suffer from new wounds and old scars, Changez finds that his place in society had shifted. With the world seemingly crumbling in front of him, Changez must decide where his true loyalties lie--with his adopted country or his homeland. 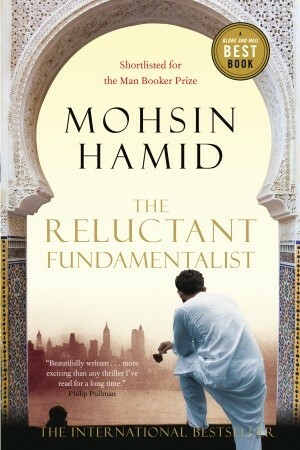 My Thoughts: The Reluctant Fundamentalist was different. It is not a book I would normally read and it is written in a way that I have never encountered before. By this I mean the book starts off with the main character, Changez, talking to an unknown man. But, however, this conversation does not stop and then it hit me: THE WHOLE BOOK IS THIS CONVERSATION BETWEEN CHANGEZ AND THIS MAN! But you never know what the American says in response to what Changez is saying, it is just Changez going on and on. This bothered me at first, but I got over it because I started getting into the book, but not because of Changez, but of his girlfriend, Erica. Erica sparked something in the book that brought it alive for me. She turned everything around because the book is about Americans, self identity and 9-11, which is pretty heavy stuff, but Erica and her struggles with her dead boyfriend, Chris, and also, her book bring this book back down to Earth. Because this book was for class, we anaylzed it like the back of my hand and that wasn't really all that bad. It was interesting to look into the symbolism since it wasn't being shoved down our throats like in The Great Gatsby. This book had me more focused on the symbols and the character's personalities rather than their stories and what they went through. Again, it was different. Different, but enjoyable and I would highly recommend it.